Mi,bi,Ed is the moment at the intersection from the right hand beam; Mj,b2,Ed is the moment at the intersection from the left hand beam. 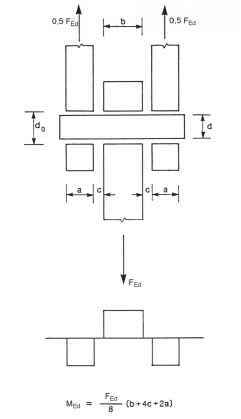 (10) In the case of an unstiffened double-sided beam-to-column joint configuration in which the depths of the two beams are not equal, the actual distribution of shear stresses in the column web panel should be taken into account when determining the design moment resistance. Table 5.4: Approximate values for the transformation parameter /?